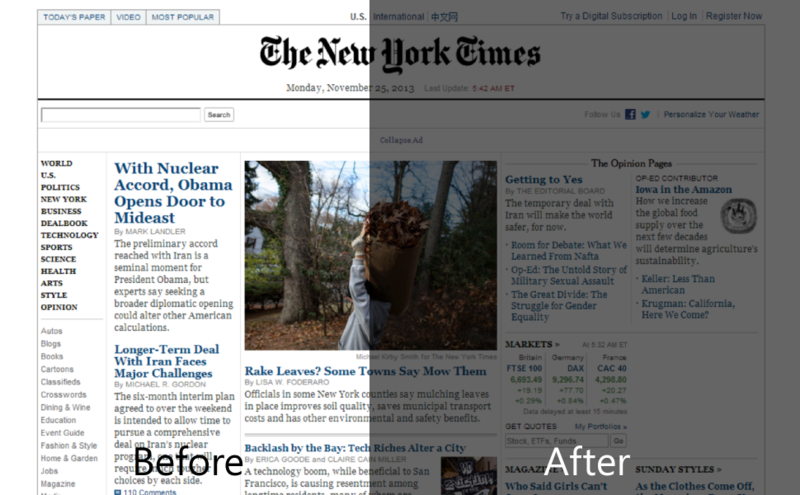 Hurt it your eyes when you are reading a newspaper online with that have a white background. In Turn Off the Lights there is a feature "Eye Protection" that will help you with this kind of problem. The "Turn Off the Lights" dark layer will be automatically added when you visited a website and this will decrease the bright white light on that web page. Here with the Turn Off the Lights you get an eye protection from computer for FREE. This by installing the Turn Off the Lights extension in your web browser. For this great feature there are four custom settings. You can enable this wonderful feature in the Turn Off the Lights options page, and navigate to the "Advanced Options". There you will see the selection of the "Eye Protection" feature. The first one, is an option that automatically do the lights off when you visited a website. And that doesn't check the source if you are on YouTube, New York Times or Mashable, it's automatically dim the page. Second option, this will do the lights off on your chosen website in the list. If the website is not in the list, it will not dark that page. The third option, this is something what everybody wants to use this feature. Here you type the time when you want the lights to go automatic off. For instance you set the time for 9:00pm until 6:00am. And when it's 7:00pm lights will go not off, but when it's 9:01pm the extension will turn the lights off. No more that bright white light of the newspaper website, that is a good point! And there's almost no limit to what Turn Off the Lights can do. There are more than hundred features inside that make the experience even better. Download Turn Off the Lights and get started today! If you want to convert the whole stylesheet of the website to a dark theme, you can use the Night Mode feature. Here it will switch from a day to a night them with one click on the Night Mode switch.